HEC Montréal is stepping up its collaboration with the MDI-Business School in Algeria by adding a hybrid-format Specialized Graduate Diploma in Management (combining classroom and distance learning) and signing an agreement for a second cohort of BBA 2+2* students. The new diploma is to be launched in May 2016. 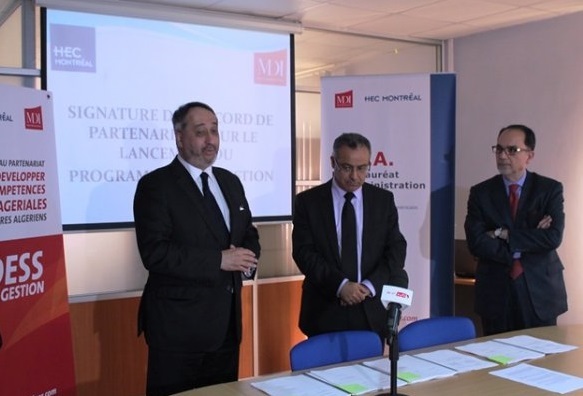 Isabelle Roy, Canadian Ambassador to Algeria, Brahim Benabdeslem, Dean of the MDI-Business School, Michel Patry, HEC Montréal Director, and a number of Algerian business leaders attended the signing ceremony in December. *First two years at the MDI-Business School, and second two at HEC Montréal. HEC Montréal Director Michel Patry, Brahim Benabdeslem, Dean of the MDI-Business School, and Hassan Taghvaï, Director of International Executive Education at HEC Montréal.